Home is not where you live, but where you hang your posters. The classic phrase "An image says more than 1000 words" Have probably most of you heard before. But what do your pictures say about you and what pictures describe you? Today we are constantly fed up with different pictures. Everything from Instagram flows, news updates and home ads, most of them serve their short-term purpose and then glow away. But what are the pictures that are long lasting and are hanging proudly on walls in people's homes. Still life, maps, quotes and flowers, the motives are many and different. We know that images can show who you are, where you are from or wherever you are going. Your posters become part of you, you see them before you go to bed and it may be the first thing you see when you go up in the morning. Walls tell a story and we at Archive Seven have carefully designed posters for all the different walls of the home, whether you want to make your home more personal, impress someone or make it more attractive, we have a picture or poster for you! We think that art itself is important for a well-being and has therefore devoted a lot of time to finding different designs so you can find what you want. 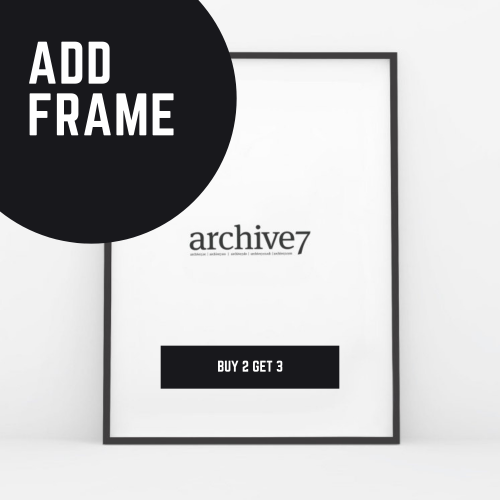 Archive Sevens vision is to deliver trendy posters to your home so that you can make your home to just your home. We print our posters on 250g, FSC-certified and age-resistant matte premium paper. We design and sell our posters in the sizes 13x18cm, 21x29.7cm, 30x40cm, 40x50cm, 50x70cm, 61x91cm and 70x100cm. Additionally, if you want to complete your poster with a frame, we offer a lot of different options in different sizes and colors that fit nicely with posters. Our posters also fit with Gallerix and Ikea frames. Do you want to make your own Posters?